In this Oct. 14, 2014, file photo, miles of unused pipe, prepared for the proposed Keystone XL pipeline, sit in a lot outside Gascoyne, North Dakota. A federal judge has ordered the U.S. State Department to conduct a more thorough review of the Keystone XL pipeline's proposed pathway after Nebraska state regulators changed the route, raising the possibility of further delays to a project first proposed in 2008. U.S. District Judge Brian Morris of Montana said in a ruling Wednesday that the State Department must supplement its 2014 environmental impact study of the project to consider the new route. Morris declined to strike down the federal permit for the project, approved by President Donald Trump in March 2017. The Nebraska Public Service Commission rejected pipeline developer TransCanada's preferred route in November 2017, but approved a different pathway that stretches farther to the east. The "mainline alternative" route is five miles longer than the company's preferred route, cuts through six different Nebraska counties and runs parallel to an existing TransCanada-owned pipeline for 89 miles. State Department officials "have yet to analyze the mainline alternative route," Morris wrote in his ruling. The State Department has "the obligation to analyze new information relevant to the environmental impacts of its decision." Last month, the State Department declared the pipeline would not have a major impact on Nebraska's water, land or wildlife. The report said the company could mitigate any damage caused. It's not clear whether the additional review will delay the 1,184-mile project. TransCanada spokesman Matthew John said company officials are reviewing the judge's decision, and noted that the project has already faced numerous federal reviews. He said company officials are still working with local, state and federal stakeholders. "We do not anticipate that the ruling will impact the current construction preparation activities we are currently undertaking," John said in an email. Environmentalists, Native American tribes and a coalition of landowners have prevented the company from moving ahead with construction. In addition to the federal lawsuit in Montana that seeks to halt the project, opponents also have a lawsuit pending before the Nebraska Supreme Court. Oral arguments in the Nebraska case aren't expected until October. Critics of the project have raised concerns about spills that could contaminate groundwater and the property rights of affected landowners. Pipeline opponents cheered the decision and said they were confident that the courts would find other violations of federal law raised in the lawsuit. "We are pleased that Judge Morris has rejected all of the excuses raised by the Trump administration and TransCanada in attempting to justify the federal government's failure to address TransCanada's new route through Nebraska," said Stephan Volker, an attorney for the environmental and Native American groups that filed the Montana lawsuit. A State Department spokesman said the agency was still reviewing the judge's order but declined to offer additional comments. The pipeline would carry up to 830,000 barrels of crude oil per day from Canada through Montana and South Dakota to Steele City, Nebraska, where it would connect with the original Keystone pipeline that runs down to Texas Gulf Coast refineries. 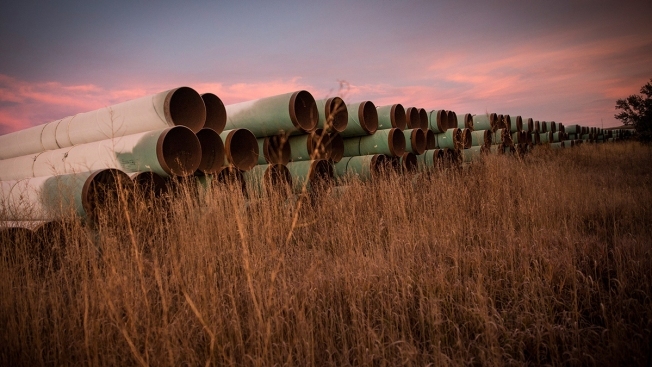 The State Department's new report noted two major spills in South Dakota involving the original Keystone pipeline, which went into operation in 2010, but added that TransCanada has a lower overall spill rate than average in the oil pipeline industry.